As with Philip, at my Grammar School in the 1960's I did cross-country stripped to the waist and barefoot. Again we started at the beginning of the Autumn Term and were used to it by the time it got colder. Nobody complained and we quite enjoyed showing off our bare chests in the local area especially as many of the lads were quite well-built and muscular. Several of the older lads had developed hairy chests as well. I was at grammar school in the 60s and, like many others, ran cross country, mainly in the winter, but always barefoot and bare-chested. This seemed quite normal and, as we started before the weather got cold we got used to it as the temperature dropped. I don't remember any-one being upset by it - we were all treated the same and being shirtless or barefoot was never used as a punishment. Some people these days seem to get upset about a little discomfort - it seems a shame barefoot and shirtless cross country is no longer the norm. Hi, I am Lars,19, from Germany. I really like this picture, because of these good locking boys. I wish, the where running stripped to the waist, to see there nice chests. As Roy said being stripped to the waist for PE was normal in the fifties and sixties. Boys accepted it and certainly there was also an element of discipline involved as well. Lads did have to do press-ups etc outdoors while stripped to the waist as a form of punishment. At my school it was simply the normal practice for all boys to be stripped to the waist for PE and nobody questioned it. I've read the last few posts about shirtless PE being linked to discipline and there's certainly no doubt this was the case at my school. Unless you forgot your kit, the only time you did PE shirtless was as some kind of punishment, often running around the football pitch in detention. Even if it was just a round of press ups, it wasn't unusual to be instructed to take your vest off first. Like many teenage boys, I was probably a bit too cocky and lacking respect and I think the idea was to take you down a peg or two. For me it certainly had that effect. I remember suddenly feeling quite small and embarrassed on one occasion when I was told to get my vest off and do laps of the gym. Finally I was allowed to rejoin the rest of the class but the teacher made it clear: 'that vest stays off'. I felt even more uncomfortable because I was surrounded by about 30 other boys all wearing full PE kit and me in just shorts and bare chest. I'm sure it would have felt different if we'd all had to do PE shirtless on a regular basis. Because we didn't, it was an effective punishment and probably helped to keep boys in line. I agree with Ben.There seems to be no discipline these days and if doing PE stripped to the waist brings this about then I'm all for it. well, if it helps to discipline boys I am all for it. Boys these days need a bit more discipline a firmer approach. Shirtless PE certainly puts them in their place. Daniel, I think there's a difference between boys choosing to go shirtless because they find it comfortable in warmer weather, and being forced to go shirtless for PE. Swimming was a bit different because no boy would expect to do that wearing anything other than shorts or trunks. But it can be a real shock for boys, especially those who are shy or self conscious, to suddenly be told they must go running or play football bare chested, something they wouldn't normally do. I could see no logical reason why I needed to be shirtless for physical exercise, it always felt like it was more about discipline. I don't see what is the problem people seem to have about lads having to strip to the waist for PE etc. You are stripped to the waist for swimming so what is the difference in having to be bare-chested for PE. Also you often see youths walking around stripped to the waist in hot weather in the summertime in any event. I went to a boarding school in the early 60s which was spartan to say the least running over the moors and through the bogs. Cross Country was always done in vest, shorts and plimsols. No underwear of any kind was allowed or rugby shirt under the vest. The first puddle in winter and the toes turned blue. In winter the ice on the frozen puddles cut the ankles. PT in the gym and the school yard was done barefoot and in some strange stretchy shorts that were more like swimming trunks. PT included running outside barefoot in all kinds of weathers. To his credit our ex-army didn't stay in his office drinking tea but joined us similarly dressed and was always ready to encourage us along with a quick swipe on the buttocks or legs. Many of our runs were timed so that he could punish any boys who had been lazy and brought in a slower time. When I was about fifteen a group of boys from a secondary modern school joined our Grammar School to do O Levels.At their previous school they were stripped to the waist for PE and at their new school they continued to be bare-chested.Gradually more and more of us started to strip to the waist and eventually we were all stripped to the waist! My parents had moved home so I changed schools too. Our PE teacher was hard (ex Army) and following a sharp frost early November I changed into my PE kit - vest, shorts and trainers for my first lesson. After leaving the comfort of indoors we were lined up on the school field and being the new boy was singled out to stand in front of the class and told to drop my vest on the freezing ground and form a skins team. Upon seing me react to the cold our teacher yelled out "You'll have your vest off until I tell you otherwise. I'll toughen you up!" For the next 5 years he was as good as his word regardless of the time of year/conditions or temperature I remained barechested for PE and Games lessons until I left at 18. To answer Stuart's questions, we always did cross country in vests, shorts and trainers or plimsolls. The only variation was when it was really hot or humid and some boys would ask to take their vests off, but I don't think anyone ever asked to go barefoot. Personally I was quite shy so I always kept my vest on for PE unless I was made to take it off. This happened quite regularly in the gym where most team sports were played as shirts versus skins. One boy in my class frequently used to turn up without his vest and therefore would almost always be on the skins team. If you were a skin you played in just white shorts, but never barefoot. Outdoors we had reversible football/rugby shirts which were worn for team sports, and black shorts instead of white. In those days the school was divided into two: lower and senior. The separation was distinctive. The lower school had a different dress uniform insofar that junior boys (ages 11-13) wore shorts and long socks with garters. The seniors wore long trousers, and sixth form students had their own tie. Various badges denoting sporting, academic and meritorious achievement could be adorned on school blazers. I once had the temerity to pin my Ian Allan Loco Spotters badge to the lapel of my junior blazer only to have it ripped off by a supercilious sixth form prefect. I was summoned to a senior house master who gave me a dressing down and threatened to cane me for bringing the school’s reputation into disrepute! I bagged a detention and I never retrieved my badge. We had a separate PE and sports uniform. The PE uniform in the lower school consisted of a white vest, white shorts and white plimsolls. The plimsolls and white vest were worn ostensibly for outside activities; otherwise we were permitted to wear only a pair of shorts. Some boys found this disconcerting, neither liking to go barefoot or bare-chested, or both. In fact, the rule was arbitrary and rested on the whim of the teacher taking us. His understanding of temperature was purely subjective, so it was not unusual for us to run shirtless in the cold. And all p.e. lessons ended with a cold, sharp shower. I have to say that the constant exposure to the elements hardened us to the point that midway through the spring term it made no difference to wearing a vest or not. We were never discouraged from discarding the vest and occasionally were told to run barefoot on the school’s grassed running track. The sports uniform was particular to whatever team game or activity we were playing. Therefore my parents had to fork out money for a full rugby strip and cricket creams, including sleeveless sweater. Lucky for them – but not for me – I inherited a few ill-fitting items of clothing from my elder brother and cousins. It is a proof that clothing in those days lasted a long time because the Bukta rugby shirt I inherited from my cousin was later donated to another cousin, who in turn gave it to a younger brother. The afternoon we played sport depended on our year group: Ist Year was on a Monday; and we all had to play on a Saturday morning. The latter practice ceased when the school became a comprehensive. Apparently the sitting Labour MP objected to the tradition (presumably viewing it as elitist and anachronistic) and the local education board stopped the practice. I was then in the sixth form and had conflicting feelings. I enjoyed playing sport but also valued the opportunity to go and earn some much needed money at Sainsbury’s. So I guess the classless socialist turned me into something of a capitalist! By today’s standard the regimen of sport and p.e. at my school in the 1960’s and 70’s would appear Spartan. My masters were men who had grown up in the 1930’s Depression and had fought in the Second World War. Their mindset was greatly influenced by their experiences. Yes, they were tough and uncompromising, and demanded respect; but they were decent and generally fair and wanted to produce fit, healthy, and vigorous young men. I would like to defend their ethos. I also realise, now with hindsight of being a father and a grandfather, how disorganised and forgetful boys and young teenage boys can be. My school’s approach to a p.e. uniform ( or lack of one) was therefore practical and insightful. I can truly say that because I had two p.e. and two sports lessons per week I entered the adult world in better physical shape than my own sons did at the same age. At my school all boys did PE stripped to the waist and most went barefoot as well. For cross country again we all went stripped to the waist and although we could wear plimsolls many went barefoot. When you were allowed to wear vests & plimsolls, did everyone do so, or did some boys still stick with bare feet, and do PE stripped to the waist ? What did you do ? Did you wear vests/shirts for cross county, or were you made to strip. At my school on the very odd occassion that we couldn't play rugby outside, we used the gym, but everyone had to take off their rugby shirts - in effect the same kit as for PE, just navy shorts replacing white shorts, nothing on our feet and bare to the waist. Reading this blog brought back painful memories. I attended a boys grammar school (that became a comprehensive under the Wilson/Callaghan governments) in London during the late 1960's and early 1970's. The rich tapestry that was our formal school uniform was strictly enforced. However the PE uniform was minimal to say the least. There was a school pecking order in those days. First and Second Year boys wore only a pair of white shorts for indoor PE, which comprised mainly gymnastics. Discipline was strict and at times brutal with plenty of "thick ears" and the occasional slippering. All indoor activities were performed barefoot. However, the regime relaxed as we got older. Senior students could wear vests and plimsolls. Outside activities were limited to rugby union, cricket and athletics/cross country. We had to have a sports uniform for these. We were expected to play in rain, hail or snow. Occasionally we were allowed to retire to the gym during periods of exceptionally cold weather. If so, we continued minus our shoes and socks. Nearly fifty years ago was the harsh winter of 1962/63 and at my school the lads still had to do PE etc outdoors while stripped to the waist. A few months later when it was quite hot we again we were bare-chested for athletics and our annual sports day. 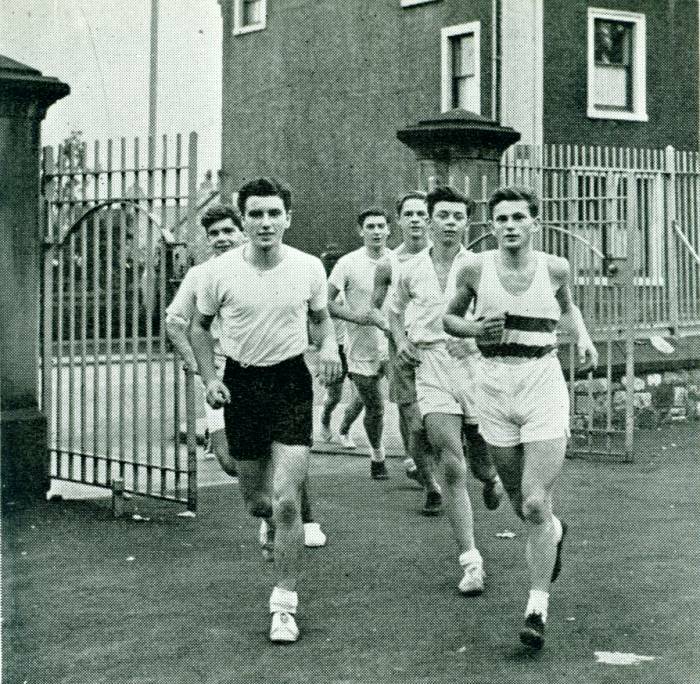 Our school was in a built up area and from the outset when we went out on cross-country runs we had to go stripped to the waist.At first many lads found it embarrasing running through the streets bare-chested but we soon got used to it. At my school you could buy a blue sweatshirt which could be worn over your PE vest for cross country. The teacher didn't mind that so a few boys, including me, got into the habit of wearing them. Sometimes I didn't even bother to bring a vest, I just wore my sweatshirt. That was unwise, as I found out when we had a new teacher who insisted it was vests only and ordered those of us with sweatshirts to take them off there and then. 'Tough' he said when I protested that I had nothing underneath my top and made me take it off anyway. I got a lecture about the importance of bringing the right kit, then I was given detention and finally, of course, I had to go and do the lesson bare-chested and shivering. I'd never run without a top before and it was a miserable experience. I had goose pimples and my teeth were chattering, plus of course I felt really self conscious - the other boys all had vests, so I was the only one stripped to my shorts. It was a huge relief when the lesson was over and I was determined to make sure I didn't repeat the experience. As it turned out, I had to do it again the very next day in detention! There were four or five boys altogether and we all got changed into PE kit as instructed - this time I wore my vest instead of the sweatshirt. But I might as well not have bothered, the teacher announced that we'd be doing detention - which consisted of another outdoor run - with our vests off. So once again I found myself trudging around with goose pimples and chattering teeth, the only slight consolation was that this time all the other boys had to bare their chests as well. As many people have said, there was no point in complaining or arguing if you were told to run bare-chested. I found it quite a shock when I started secondary school and learned that my PE kit was shorts, socks and plimsolls and nothing else. At first I thought it must be a mistake but realised it wasn't when I started getting changed for the first PE lesson and saw the other boys in my class stripped to the waist. Many didn't like it and one or two were in tears but nobody dared to question it, we just had to get on with it because those were the rules. Like Adam and Mark our school shared a site with a secondary modern school and the boys there always did PE stripped to the waist. One lad at our school started to take his vest off and more and more boys followed suit so that eventually all of us were stripped to the waist both indoors and for cross-country runs. We were supposed to wear a vest for PE but one lad sarted to go stripped to the waist.More and more boys followed suit and eventually we were all stripped to the waist. As Matt and others have said it was the norm for boys to do PE stripped to the waist in the fifties and sixties.You would start doing it often from the age of seven right up to the Upper Sixth when many hairy chests were on display! As Ronan said how fortunate those boys were.At my school we had to run stripped to the waist in all conditions including fog rain and sleet. I noticed that whenever a boy was stripped to the waist for games especialyy on sports days the girls always seemed to hang around by them!! I agree with Roy that being stripped to the waist as a matter of course made us proud of our bodies. If you stripped to the waist for PE it tended to make you look after your bodies properly.I grew to be quite proud of my muscular body especially when I developed a hairy chest!! Doing PE etc stripped to the waist was normal in the fifties and sixties normally from the age of seven.Boys got used to it.We had to. I remember having to do PE outside while stripped to the waist whatever the weather conditions.Thiswa also in the sixties. Like Adam we shared a site with a secondary modern school and again the boys there did PE stripped to the waist while we had vests until we shared a PE teacher with them.He made us go stripped to the waist as well and eventually we got used to it and accepted it. Our PE kit was shorts and plimsolls so we did games etc stripped to the waist right from the start.This included the winter of 1962/3.It was also common for the boys to go barefoot as well. I went to a grammar school in the sixties.The school shared a site with a secondary modern school.The grammar school uniform for PE was vest and shorts while the secondary modern boys were stripped to the waist.However it was not long before we shared a PE teacher with the secondary modern and on the first lesson we had to strip to the waist.It was cross-country and it was raining heavily.I remember running through a built up area stripped to the waist and with the rain water running down my bare back.Thereafter we had to do PE stripped to the waist all the time. Like JB we were supposed to wear vests and shorts for PE but one boy started to go stripped to the waist and afterwards more and more lads joined him and evetually the entire class was stripped to the waist.The teachers said nothing.We were about eleven when this started and this carried on into the sixth form.By this time some of the boys had hairy chests. We were suuposed to wear vest and shorts for PE but gradually the lads started to go stripped to the waist.Evntually the master in charge made us all go stripped to the waist whatever the weather bot in and out of doors. I agree with Mark.When boys did PE stripped to the waist and nothing was said more lads took off their vests and did PE bare chest. Like JB our kit was singlet and shorts but many boys went stripped to the waist.The masters said nothing but as time went by more and more boys went bare chest both inside and out of doors. Like RF I had a similar experience but I was not only stripped to the waist but barefoot as well. On my first day's PE all the boys put on our shorts and bared our chests.The master in charge then made us take off our socks and plimsolls and go barefoot both inside and out doors. I remember the harsh winter of 1962/3 when all the boys had to do outdoor PE in the snow stripped to the waist and barefoot. Then after that we had to have a cold shower. I too wasn't used to seeing other lads naked but soon got used to it. When I was about to move to secondary school in the late 1950s my parents had to go to a new parents evening at the new school. While there they were told about the uniform including that for PE etc. When they came home my dad told me that I would be doing PE stripped to the waist.I was apprehensive about it as I had never done bare-chested before. When the new term started we had PE on the first day and we all changed and most of the other new boys(from other primary schools to mine ) were used to going stripped to the waist. I reluctantly took off my shirt and went into the gym bare-chested along the other lads. However once I had stripped to the waist for the first time I found it perfectly natural and had no qualms thereafter. I was also worried about showering naked alongside other lads but there again I soon got used to seeing other boys naked. The school uniform listed our kit as a vest, shorts, ankle socks and plimsoles. However after changing for our first PE lesson we were to find our teacher thought differently. After being taken outside and lined up on the yard he walked up the line letting us know what was expected in terms of effort and when he reached the end of the line randomly picked a boy and made him face the class and take his vest off. Regardless of the activity,the time of year or the weather,indoors or outside, we remained barechested until we left. As you moved up the school there was no shortage of interest from girls watching and eyeing you up. I was at school in the late 70s/early 80s and officially the boys PE kit was vest, shorts, socks and plimsolls. However there were some PE teachers who would make you strip to the waist, probably because they felt it helped to enforce discipline. Looking back, I think it did, although I learned that the hard way. In one PE lesson, I was having a play fight with one of my friends when we were meant to be listening to the teacher. He spotted us, yelled at us both for a bit and ordered us to take our vests off. Then we both had to run laps aroud the gym for the last few minutes of the lesson. After that we got another stern talking-to and were told that, as a punishment for misbehaving, we both had to do the next PE lesson barechested as well. I didn‚Äôt like the sound of that because I knew it was cross country, and stupidly I decided to bunk off. I can‚Äôt imagine how I thought I‚Äôd get away with that, especially as my mate was more sensible, he went along and did the run with his vest off. Not surprisingly, I was in plenty of trouble and I ended up getting detention and having to apologise to the teacher. There was also an extra punishment ‚Äì instead of just one lesson, I was to lose my PE vest for the rest of the term. Indoors or outdoors, it made no difference. It was a thoroughly miserable experience, especially when we did cross country in wet weather and I had to run with the rain pouring down my bare back. It felt lonely as well, being the only boy in the class who was stripped to the waist. At one stage I actually went and begged the teacher to let me wear my vest again. Unsurprisingly, he was having none of it and warned me that he wanted to see me putting in more effort in lessons before he‚Äôd consider ending the punishment. Although it was totally unfair, I knew I had no option but to do as I was told ‚Äì it was the teacher‚Äôs decision, not mine, what I wore for PE. I didn‚Äôt like it, I didn‚Äôt agree with it ‚Äì in fact I was close to tears at that point, but I reluctantly removed my vest and resigned myself to another term of barechested PE. I made sure I never stepped out of line after that and thankfully we had a different teacher the following year. My first experience of being stripped to the waist at scool for games etc was when I started at junior school.I was nearly eight and we had to do a short cross-country run through a built up area near the school.When we changed the teacher made us boys strip to the waistI.After that it was quite normal to be bare-chested for all games etc. I was nearly nineteen when I left school and by then I had been stripped to the waist for games for nearly eleven years.Also now I was quite muscular and with a hairy chest. Steve and others.Boys' attitudes to being stripped to the waist didn't matter as if the masters told you to strip to the waist for games etc then you stripped to the waist-end of story. Steve, Our kit was simply a vest, shorts and plimshoes however our teacher would have either the whole class stripped to the waist or keep half in vests. I was 12 when during an outdoor fitness session when I made the fatal mistake of answering back. Our teacher really didn't "do" comments and picked me to remove my vest when he turned and said "You'll not be saying that after I'm finished" After the lesson ended I was told "press ups and laps of the field for you tomorrow". The following morning it was chucking down with rain and I thought my punishment would be put back....erm no. I was taken out of my English lesson and down the changing room. Having changed I was taken out onto the school yard, which ironically the English block overlooked and told to get my vest off and leave it on the yard. I was made to start my press ups and a few minutes later was completely soaked. Then came the run - 13 laps round the field. After finishing I thought that would be it but was made to do another lot of press ups in one of the puddles that had formed on the field before I could finally go in. I never stepped out of line again and nor did my PE teacher ever pick me to wear a vest again at school. In those days there was more discipline in school and if told to do PE stripped to the waist you did it and didn't get stroppy. In those days school rules said that boys did P E etc stripped to the waist and sometimes barefoot as well.It was no use complaining(not that many boys did) because you would more than likely receive up to six strokes of the cane while stripped to the waist. I agree with David. Being stripped to the waist certainly toughened you up.That is what youths need today. I think that in the fifties and sixties most boys accepted that you did P E etc stripped to the waist whatever the weather both inside and outdoors. I also did cross-country stripped to the waist and barefoot.As our school was in a built up area we ran through the streets so that passers by could see us.No one was bothered by that.Many of the sixth formers were quite muscular with well developed shoulders and chests and some of them had hairy chests as well.